THE CONTEST IS OFFICIALLY CLOSED!!! Elaine C. from Tucson, AZ. If it weren’t for bad luck, Savannah and Dirk would have no luck at all. As Savannah and Dirk stand in shock, watching the building where they were to be married burning to the ground, with her wedding gown and the bridal party’s dresses burned to cinders. The unhappy couple are discussing the fact that Dirk should not have hit the fireman (a friend of Dirk’s) who stopped him from running back into the building to try and save Savannah’s and the Bridal Party’s dresses. Jim’s phone rings and he turns away from the unhappy couple to answer it and find out that the fire was a case of arson and that it appeared to be the work of a serial arsonist who they were looking for. Dirk and Savannah decide to help look for a suspect since their training gave them the knowledge that most arsonists stick around to watch their work and get some sick pleasure out of it. They split up and start looking carefully through the crowd. Savannah notices a lone watcher on a high point over the parking lot and slowly approaches from a tangent. She calls Dirk and tells him she thinks she’s got their guy. She quietly approaches and finds a young man so fixated on the fire below that he is unaware of Savannah’s approach. Noticing a reversed Pentacle on a chain around the suspect’s neck she calls Dirk with her location and that she is sure this is the guy. Long story short, they collar the guy and he’s off to jail. Dirk and Savannah are now at a loss with how to proceed with their wedding plans. They’ve spent a bundle and can’t afford to be this extravagant a second time. Thankfully they have wonderful friends in John and Ryan. These wonderful guys have decided to gift Savannah with a Wedding Planner to help them find a new venue for their wedding at a price they can manage to squeeze out of their savings. While everyone has heard of Bridezillas, Madeline is the Planzilla of the worst sort. After Van gets her to actually listen, they manage to find a sort of happy medium on venues and costs. The wedding is back on. Of course while all this is going on, Van’s family is ensconced in her small house rubbing on her last nerve and eating her out of house and home while turning the place into a veritable pigsty. Finally the happy day again arrives, and as Savannah gets ready to walk down the aisle she asks her sister Marietta and asks her if she has Granpa’s ring. Marietta looks at her blankly for a second and thinks. Oh, I stuffed it in that big white garbage bag with all your other stuff. Savannah takes off for the Bridal Room praying that the bag is still there, along with the ring she was going to give Dirk. Entering the room she finds the ring and looking out the French Doors to a patio attached to the Bridal Room. There she see’s Madeline face down in the pool DEAD! Calling her sister Marietta to go and get Dirk, she verbally chastises her for arguing. She tells Dirk that he might as well bring Dr. Liu along since she’s the Coroner and can begin processing the scene. Another wedding day ruined and a probable murder to solve. I love this series. I’ve been a fan since “Just Desserts” came out so many years ago. I am sure that this series will be around for many more years. FTC Full Disclosure: I received this book from the publisher who only requested a fair and impartial review. 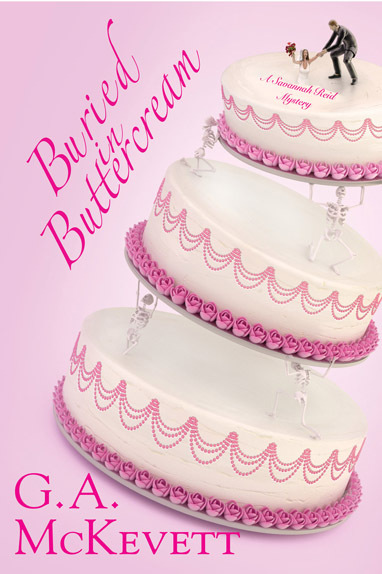 The publishers have kindly offered me a copy of Buried in Buttercream for one lucky entrant. The author, G.A. McKevett has graciously offered to send a personalized bookplate to the lucky winner. Tell us why you want to win “Buried in Buttercream”. You must leave a valid e-mail address in the comment box with your comment (it would also be nice if you became a follower of my site but it’s not necessary to enter). Please break it up using (at) and (dot), like domain (at) host (dot) com. This is only open to US & Canadian mailing addresses—sorry, no international entries this time! Contest ends on Friday March 30th. at 6pm EST. Winner will be notified by e-mail and has 2 days to respond. The book will be shipped directly from the publisher. The winner will be chosen by using random.org to make things fair. This sounds wonderful! I’ve read this author before and love her work. I’d love to enter. I love cozy mysteries so I’d like to win the book. I haven’t read any in the series. I love the pink cover. What a great sounding book. I am a lover of Cozies so this fits the bill! I love to read your books sometimes I gave to wait awhile to read them, Being on a fixed income I depend on the library for books. Can’t wait to read the book. i hope to win Buried in Buttercream as it has been on my WishList for a long time!!! Love this series! Always an entertaining fun read 🙂 Looking forward to the new book! I love this series. I have read every book (some more than once!) and absolutely can NOT wait for the new book! Thanks for such a wonderful giveaway. Sounds like a winner! Am anxious to read this next-in-the series even if I’m not the winnter. When I read that Savannah and Dirk were finally admitting their love for each other, I drew in the deepest breath, held it for a minute and slowly exhaled! The author has made these characters seem like our friends. I anxiously await her new book and a long awaited wedding! I love to series and hope to win!!!!! I love the Savannah Reid series – she’s a smart and sassy heroine. Please enter my name in the giveaway. Thank you. When Dirk proposed in the last book I cried. I got so excited I can’t wait to read it. A friend lent me all the books last year when I was recovering from surgery and I fell in love with Savannah and Dirk. I have been a huge fan of Savannah since I read my first one a few years ago. Since I recently lost my job and rent comes before my love of books, it would be awesome if I could win a copy! P.S. email is AmandaPeters2010 at live dot com. Like many Savannah Reid fans, I have been waiting for this wedding. And it sounds like just what I would imagine. I would love to be able to read the book before my library has it available. We don’t have holds so it is first come, first serve. Sounds like fun. And who doesn’t like buttercream? When I pick up the latest Savannah book, I settle in as if I’m catching up with a group of old friends! I have read each and every one. I have also really enjoyed getting to know the author better on Facebook. I can’t afford to buy books any more, I get them from the Library. I’d treasure my very own copy of a Savannah book! Read the sample. I would love to win a copy of this book. I have never came across another author as open and friendly to their fans. She speaks to all of us one on one on her Facebook page and even leaves comments about my posts or photos! Love her , love the series!!!! Pick me lol. The premise seems really well. I have not had the opportunity to pick up this author or the series before. Romance and mystery are now my mainstays it seems. Good Luck! Savannah is… scintillating… skyblue staring… scrupulous (sometimes)… spiritual… suggestive… seldom squeamish… somewhat spry… spirituelle… searching… safe… steady. Signing in for success, for Savannah’s subsequent sceme.